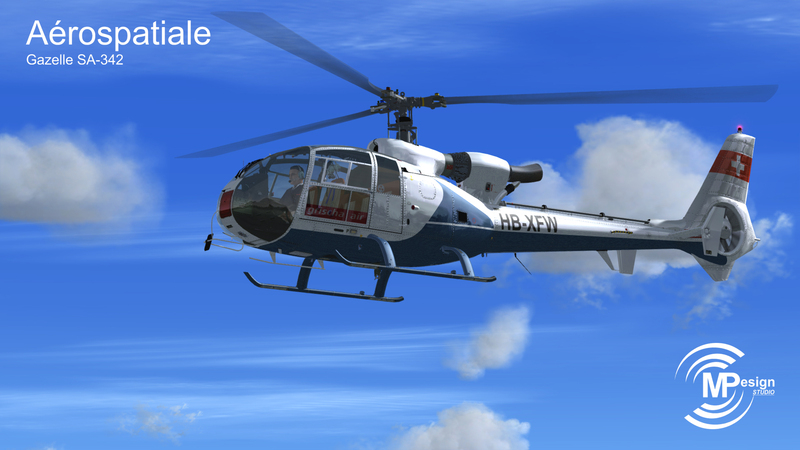 Long time user of helicopter in fsx,this product is one of the few that describe what a chopper feels like, and what a gazelle feels like and right out of the box, no extra needed. 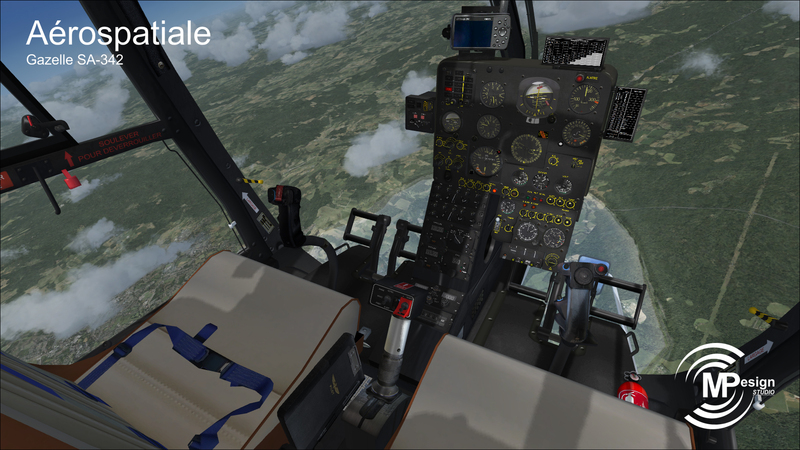 Superb flight handling, very extensive systems and behavior, the whole custom coded by a competent and kind team (support is excellent too). 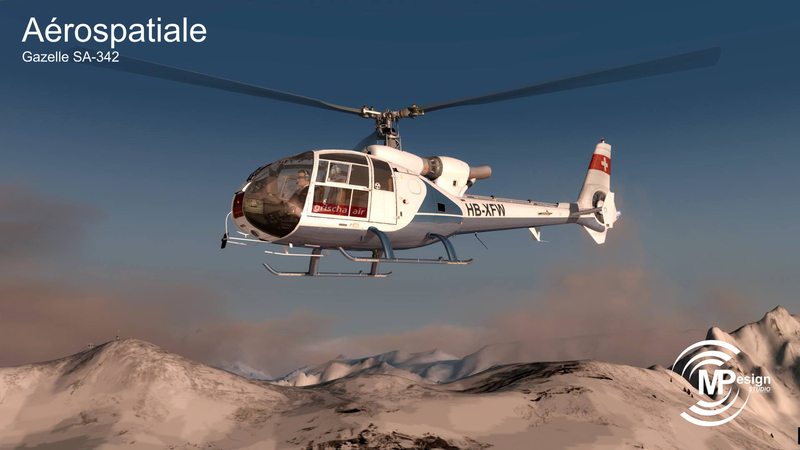 The price tag is unbelievably low for this kind of product.One of the two or three chopper really worth in FSX for people who want an taste of choppers.Can't wait to see what's next! 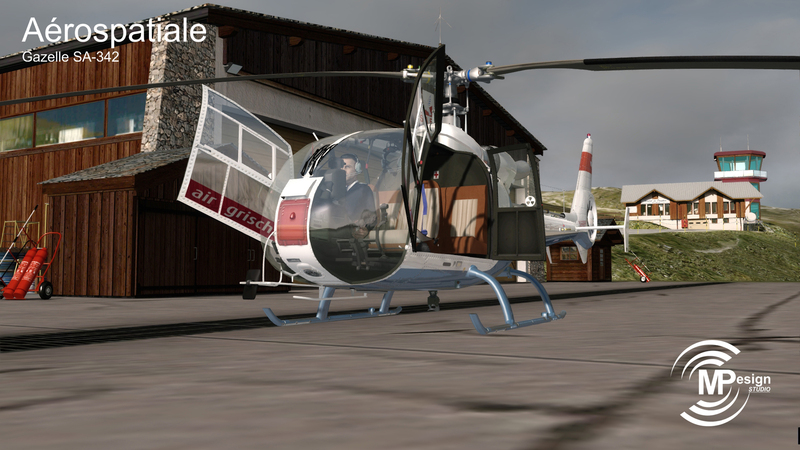 Barely a few minutes after being in the cockpit of my newly acquired SA342 Civil Gazelle HB-XFW, I knew right away that this was a very special chopper. 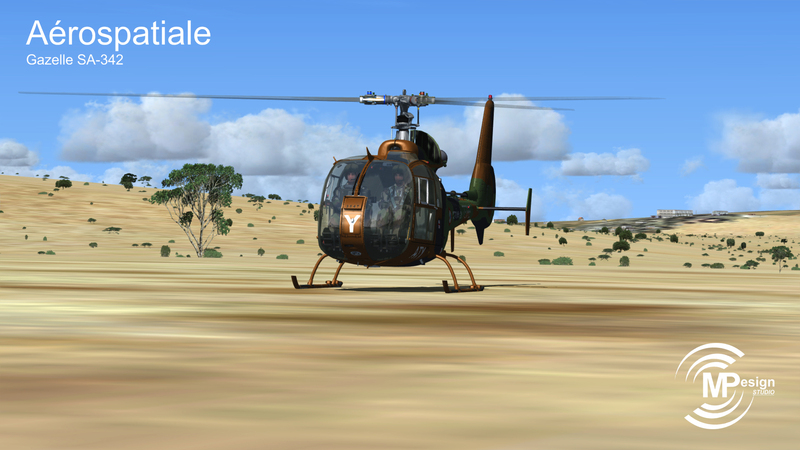 Without a single doubt, those distinctive SA342 Gazelle's are certainly a few "light years" away, than any default helicopters in basic FSX or Prepar3D platforms. So many intricate details will slowly emerge all along the pilot many hours of proud ownership. I will let you all discover them by yourselves, for risking of spoiling all the fun and amazement. A real testament to the dedication of the MP Design Studio staff. Customer service was excellent, just as the software itself. 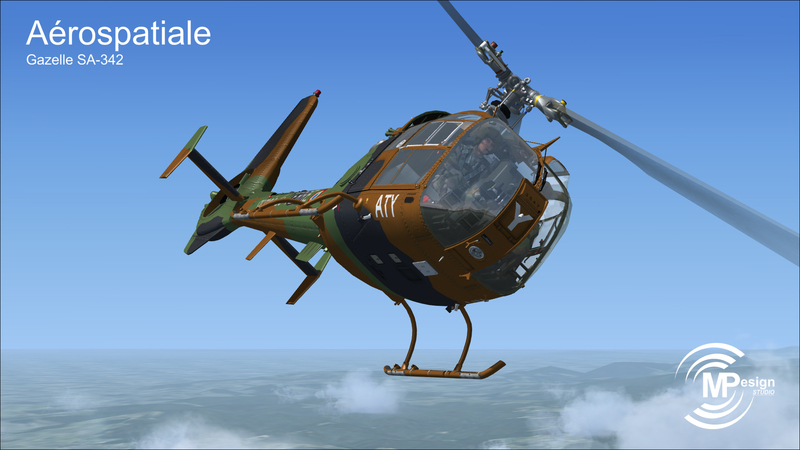 Downloading the Gazelle's program was a manual process of directing the software, to your respective simulator application on your PC. 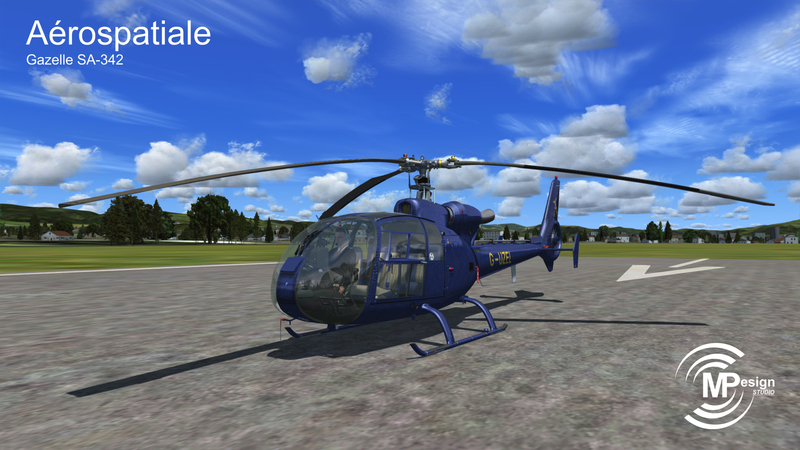 It's a pleasant rotorcraft and for a beginner like me they have a great support team ! 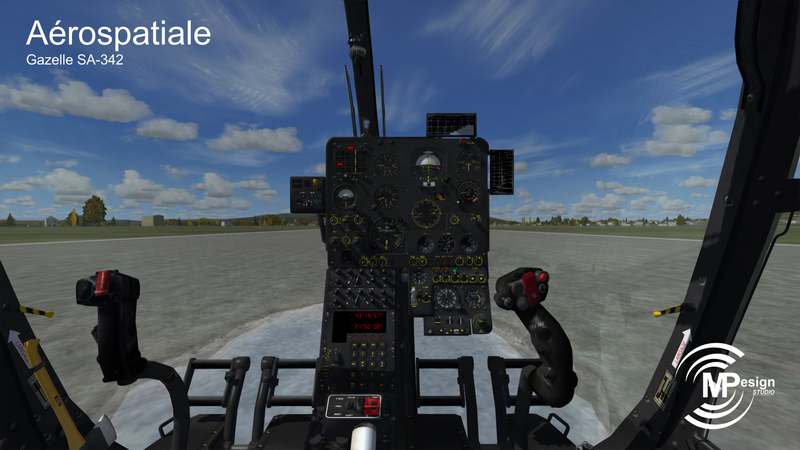 The cockpit’s vibrations in flight, terrific sounds and maneuverability at medium and full speed are extremely immersive. Delicate to fly at slow speed, it will require patience to break in and that’s also part of the charm. Cold start procedure works fine, even if the documentation doesn’t explain how to proceed. The documentation is well illustrated but not explanatory, anyway. It’s very easy to find guides online for anyone interested in starting this model from scratch. 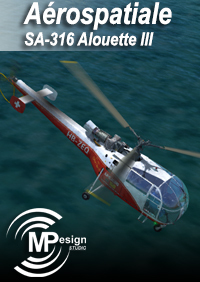 For an FSX helicopter and all the known problems related to helicopters’ implementation on this platform, the designer did a fantastic job with this model. And, on a side note, his communication is excellent. I had several detail questions which I asked by mail. They were answered within an hour with joined pictures to illustrate the main points. Kudos and Bravo! I bought this product with low expectations, but boy, was I wrong. 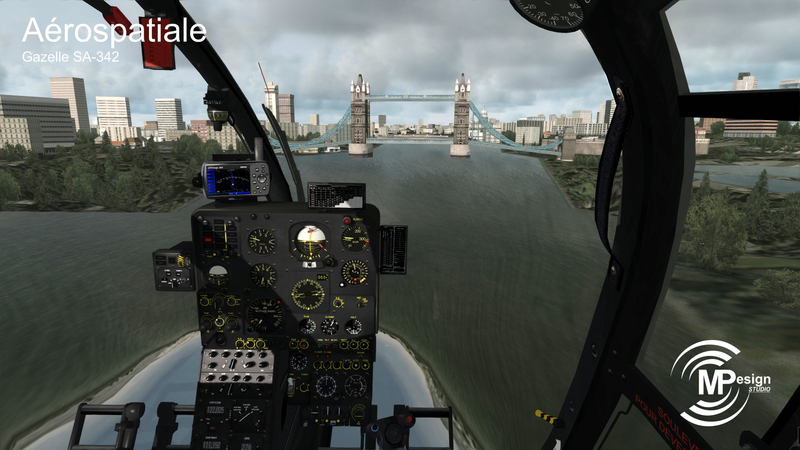 I have all the highend, payware helicopters and not one of them does something that you guys did that makes your helicopter feel so real and immersive. 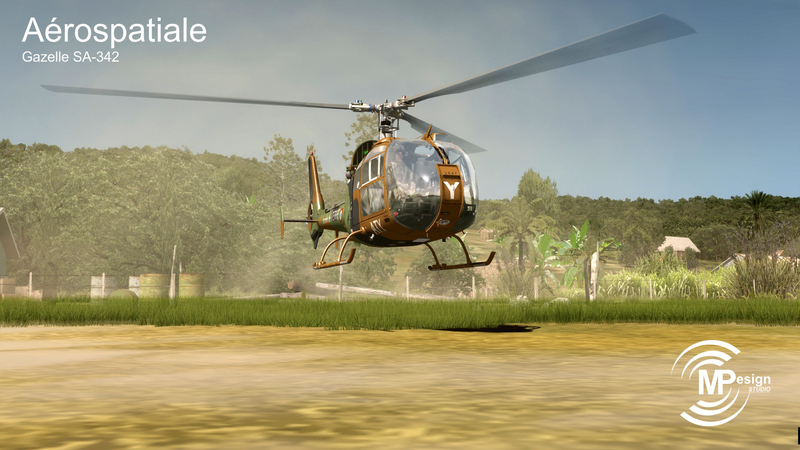 You made your helicopter vibrate just like real helicopters do. The others, some that I spend around $50 for are completely still when sitting on the ground...like a photograph. 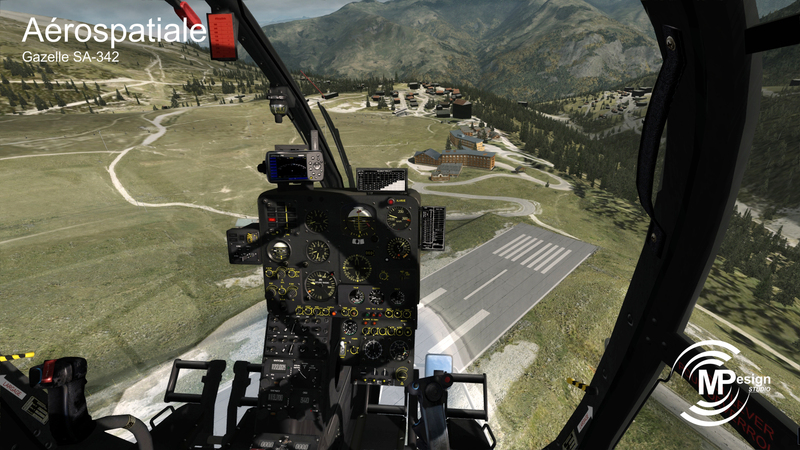 Your helicopter is amazingly lifelike and that makes all the difference in the world. 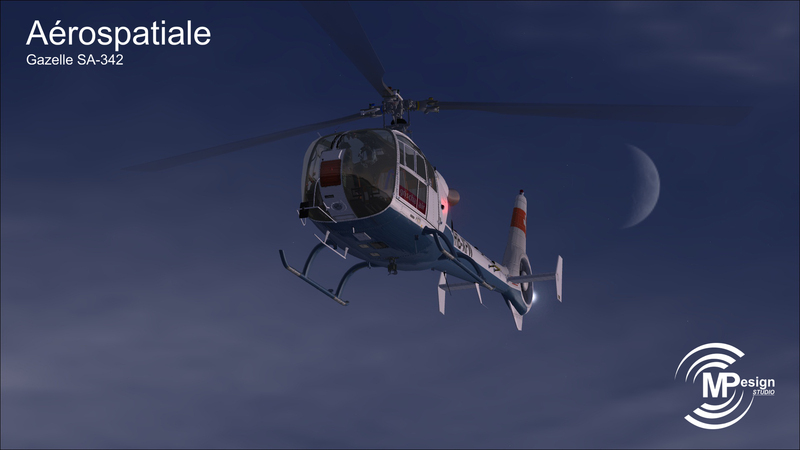 I have hundreds of dollars invested in FSX helicopters and my new “go to” helicopter is going to be one that’s less than $20. I wish I had found yours first. My compliments on an amazing piece of work. 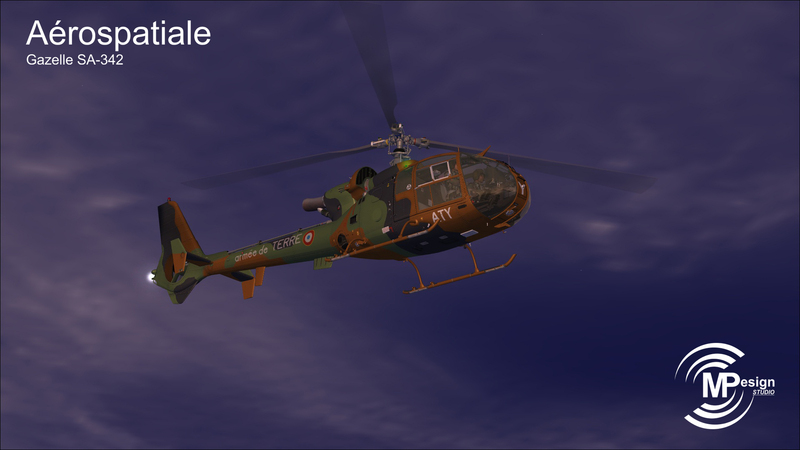 My only issue with this helicopter, and it can’t be helped being a French product, is that everything is in French. 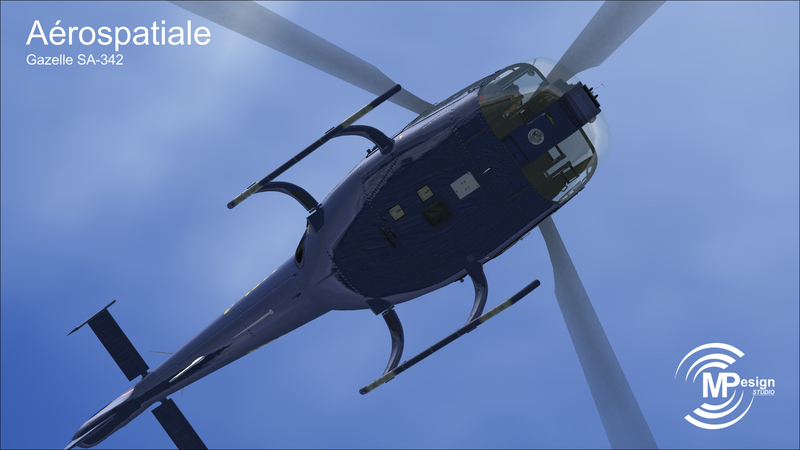 I highly recommend this product for anyone interested in helicopters. 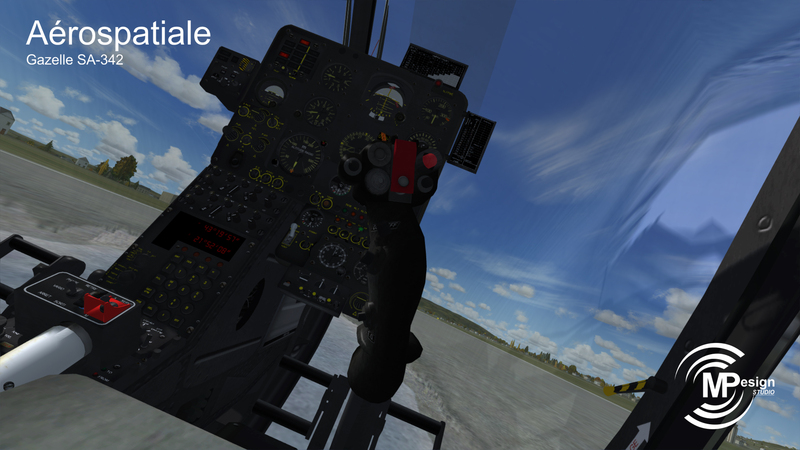 I placed this one in P3D V4.1 and it works fine. Got some help from the dedicated staff for sound and white reflation on front windscreen. 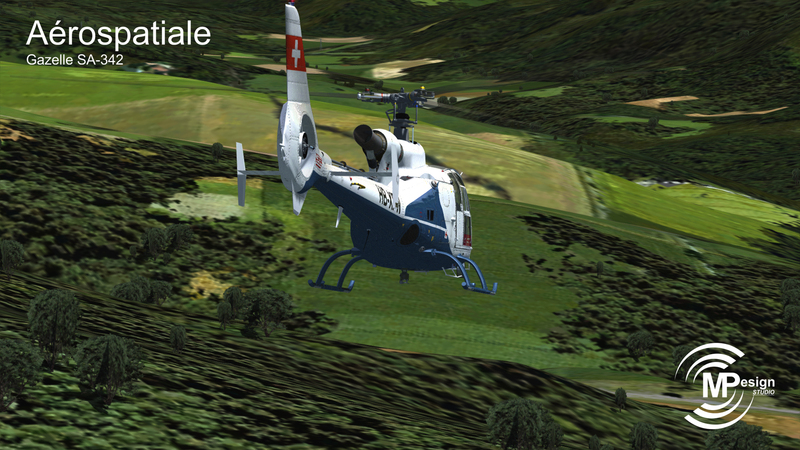 I can only say good things about this heli indluding flight dynamics. 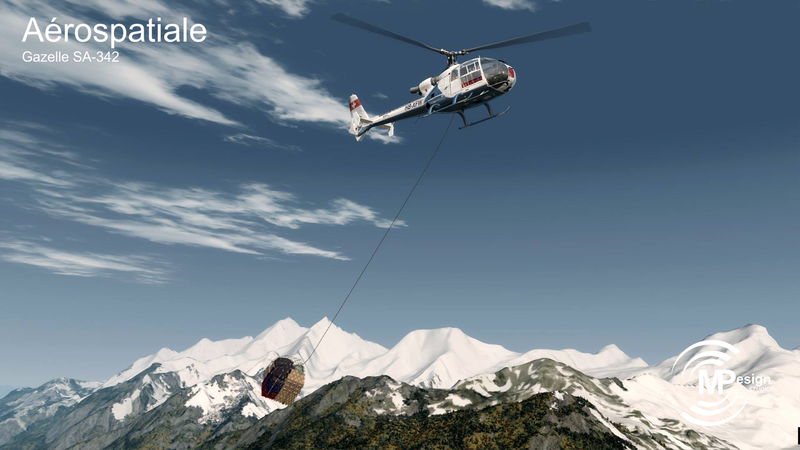 I recommend this product to anyone who is interested in flying helicopters. It's one of the best simulations I've ever experienced. In addition, the support of the developers is outstanding, all questions are answered quickly and competently. Keep it up! 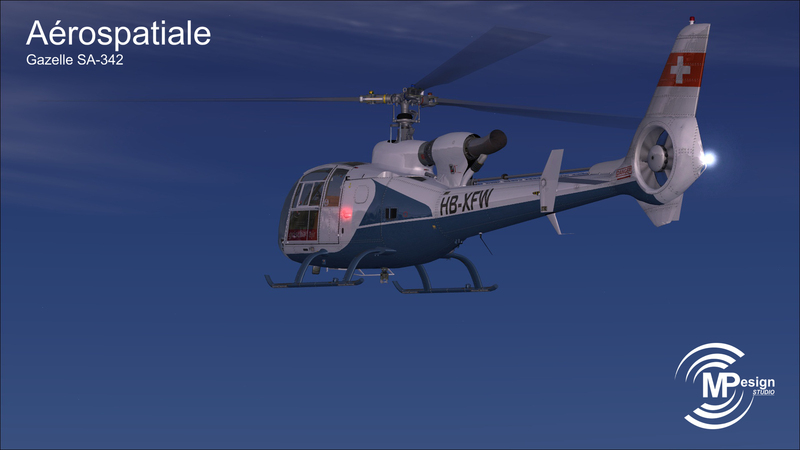 Terrific helicopter for a great price for a sim (FSX) short on quality choppers. 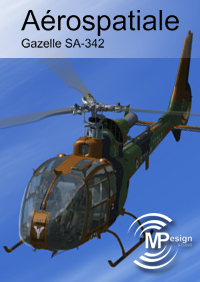 Captures the look and feel of the Gazelle (based upon my experience with PolyChop's SA-342 for DCS World). My only reservation is that I could never get this chopper running from a cold start. I contacted MPDesign and they were very helpful in my efforts, but I can only conclude that there is something about my setup that foils the startup process. 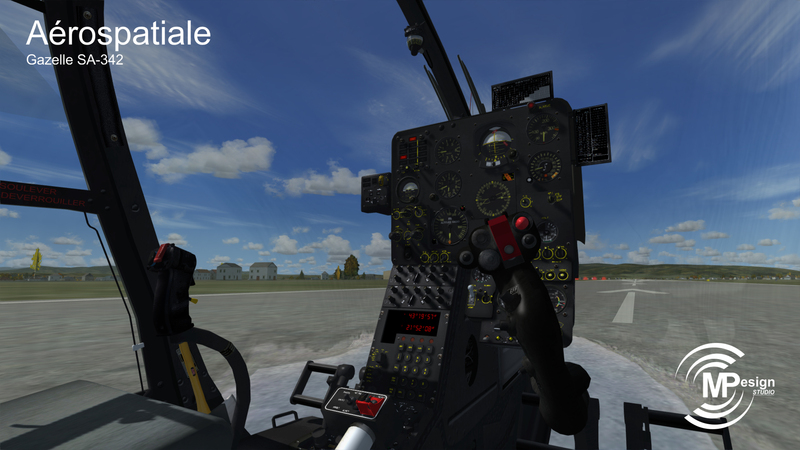 One thing I learned is that in order to start properly, the fuel flow lever must be in the fully off position, something that my Saitek X52 Pro HOTAS cannot accomplish when the fuel flow is bound to a rotary dial (the workaround is to use the keyboard to zero fuel flow instead). The documentation is lacking the cold start procedure, which would have been helpful. - When I attempt a cold start (based upon real-world manuals and other resources) the procedure comes to halt because the ignition switch is stuck in the OFF position, and no amount of left or right clicking or mouse wheel scrolling or keyboard action will get it to budge. What am I missing here? 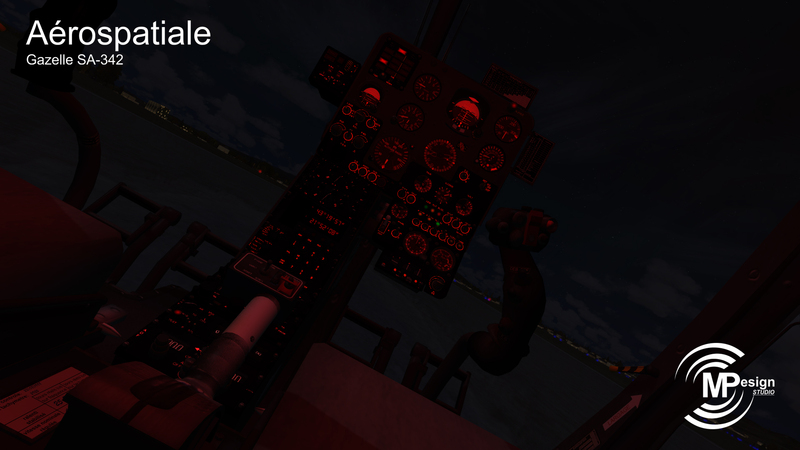 Excellent add-on for FSX/P3D. 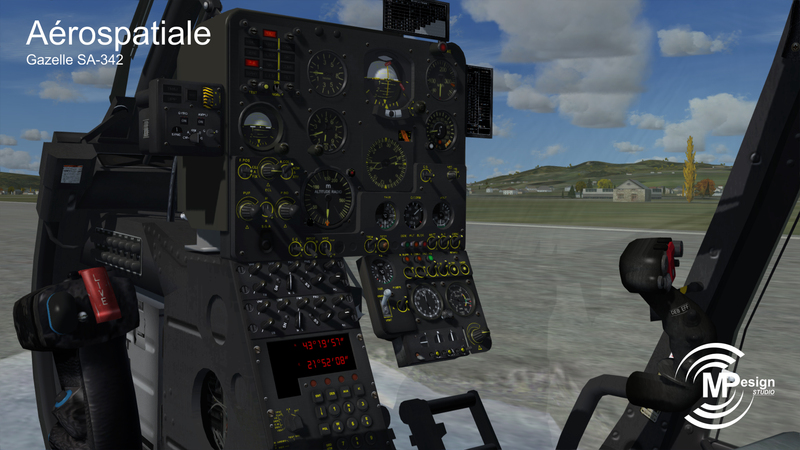 Feels very realistic and is a joy to fly. 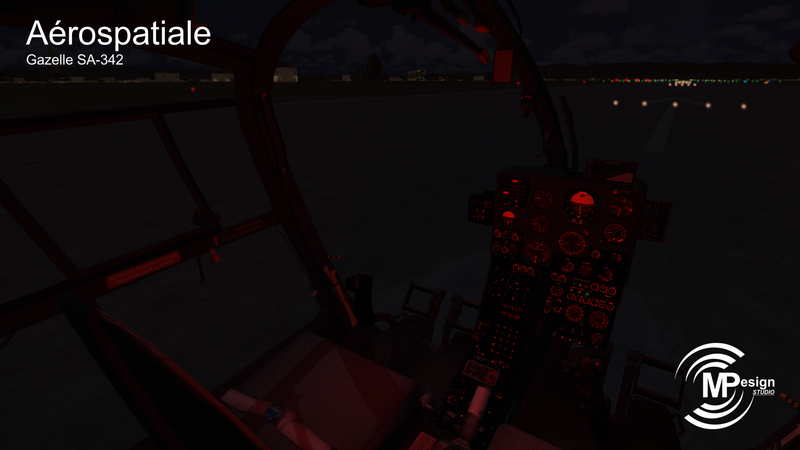 I fly with a VR headset and the immersion is incredible. Great value for money. 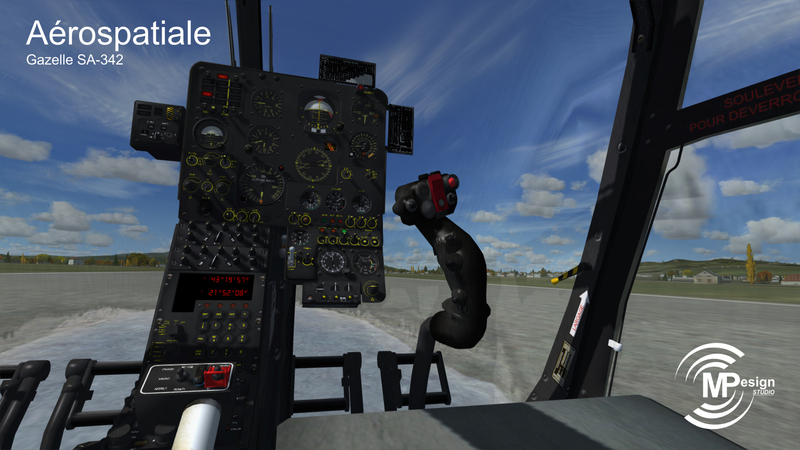 While the aircraft has somewhat reasonable helicopter flight characteristics (for P3D anyway), the VC is simply not up to par with modern payware, even for the low $15 price. This is barely above most freeware. 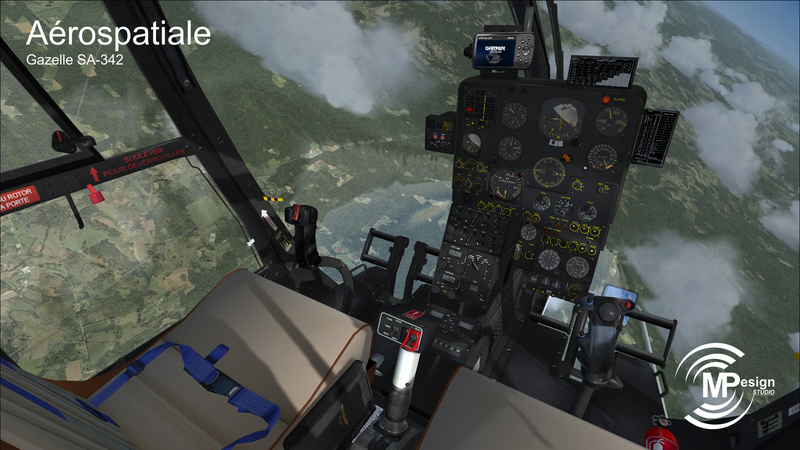 I was willing to try this as there are not many proper helicopters natively produced for P3D and it was very inexpensive, but I won't be trying other models from this developer. I currently give this addon only one star, as the documentation is appalling. To read that I can use the real world manual is all good and fine, but I have no access to the real world manual. I cannot get the engine to start at all on my set up. I cannot see what I am doing wrong, and without a simple to follow checklist, it is not straightforward. Come on guys, you need to do better than this! 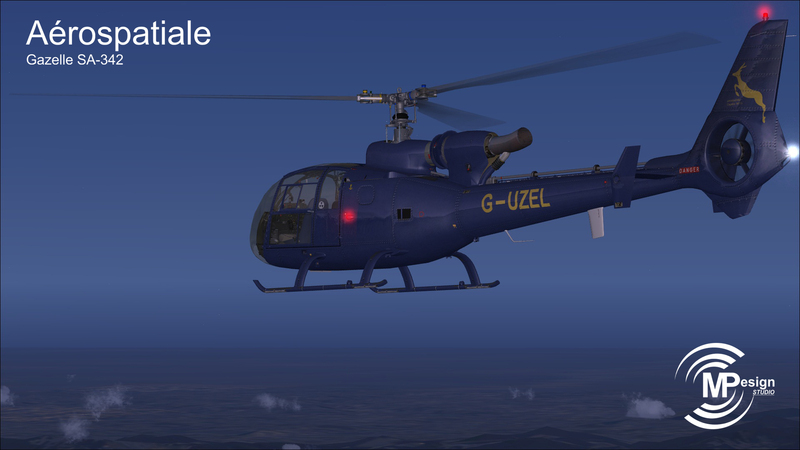 This Gazelle is AWESOME!! The flight model and dynamics are second to none. 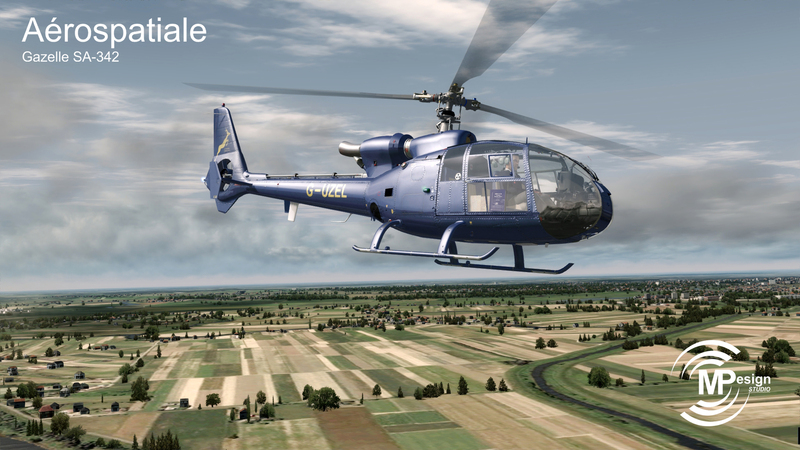 This is by far the most realistic helicopter to fly in FSX / P3D. You get Vortex ring state, torque effect, transverse flow effect, even ground resonance! 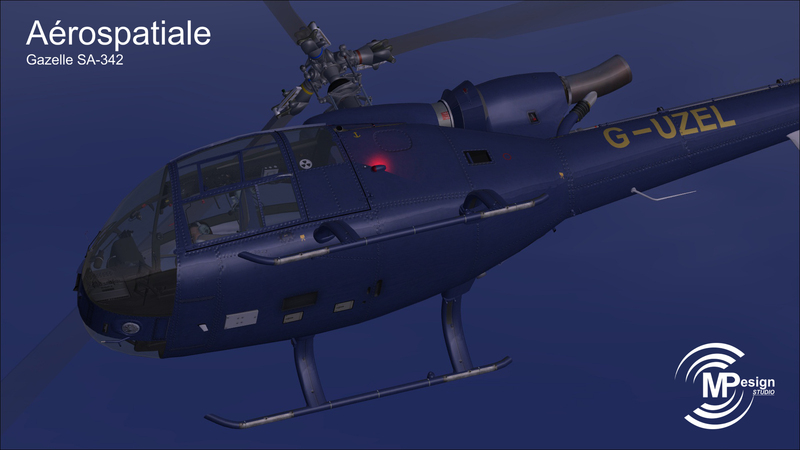 This is the standard that EVERY other helicopter should meet for "As real as it gets". My hats off to MP Design Studio. 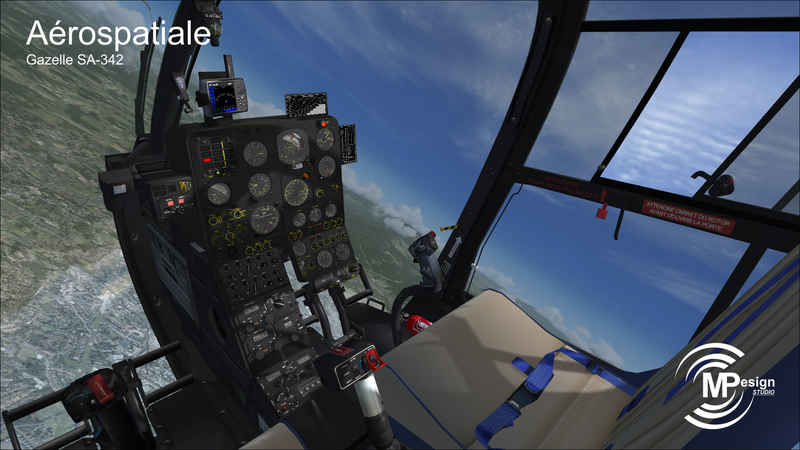 Pros: Great price, AWESOME Flight model, flight dynamics, excellent sounds, realistic behavior, great VC cockpit, excellent animations. 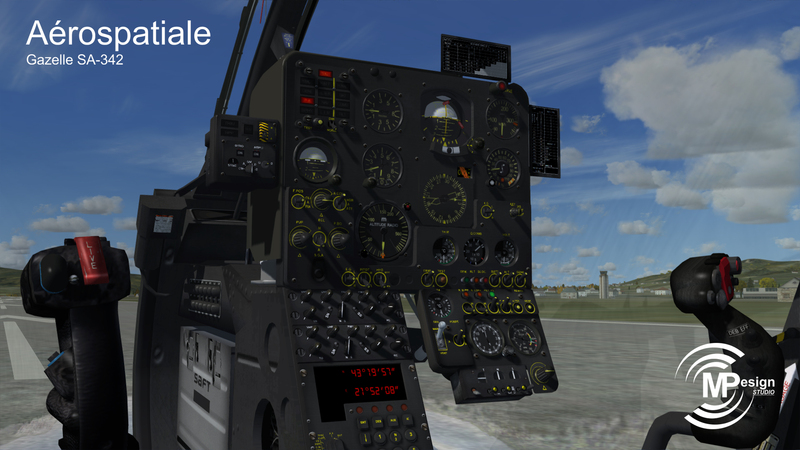 Cons: No external views except for FSX standard spot, flyby, etc . . . Small choice of different paint liveries. 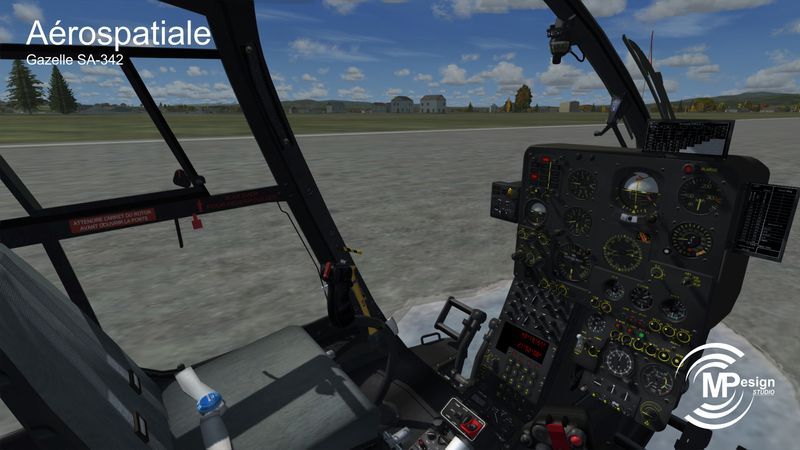 Summary: Still a 5 star helicopter, worth the price, so much fun to fly. HIGHLY RECOMMEND buying it. 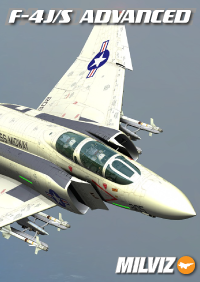 NOW PLEASE do a SA-315B Lama like this !!!!! 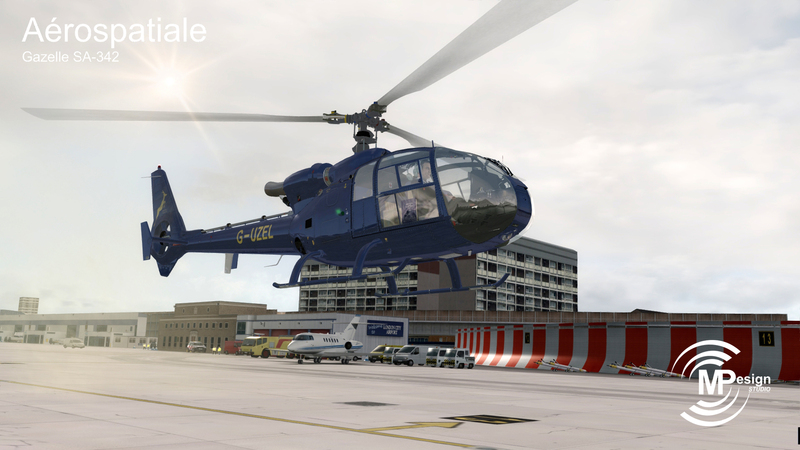 or an FSX helicopter and all the known problems related to helicopters’ implementation on this platform, the designer did a fantastic job with this model. And, on a side note, his communication is excellent. I had several detail questions which I asked by mail. They were answered within an hour with joined pictures to illustrate the main points. Kudos and Bravo! I bought this product with low expectations, but boy, was I wrong. 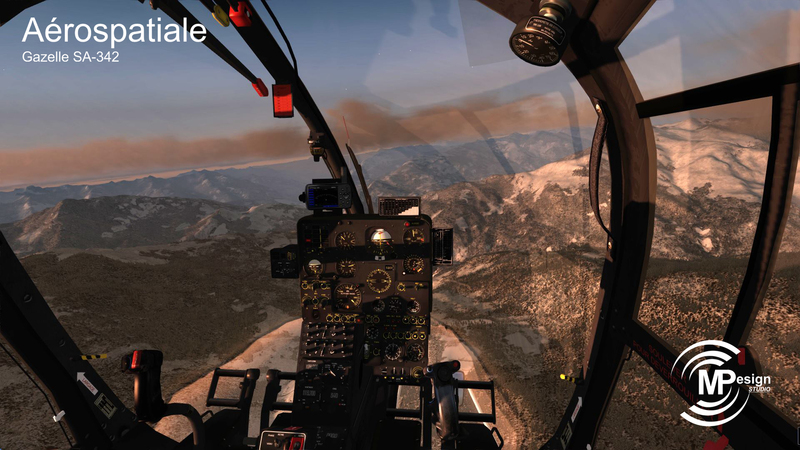 I have all the highend, payware helicopters and not one of them does something that you guys did that makes your helicopter feel so real and immersive. 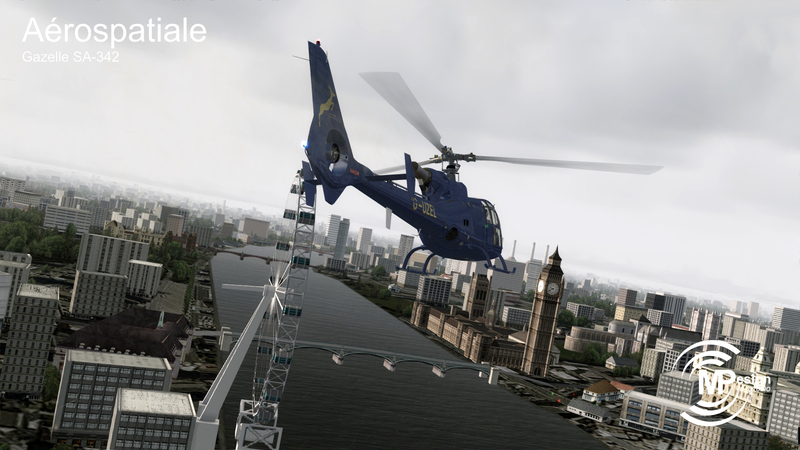 You made your helicopter vibrate just like real helicopters do. The others, some that I spend around $50 for are completely still when sitting on the ground...like a photograph. 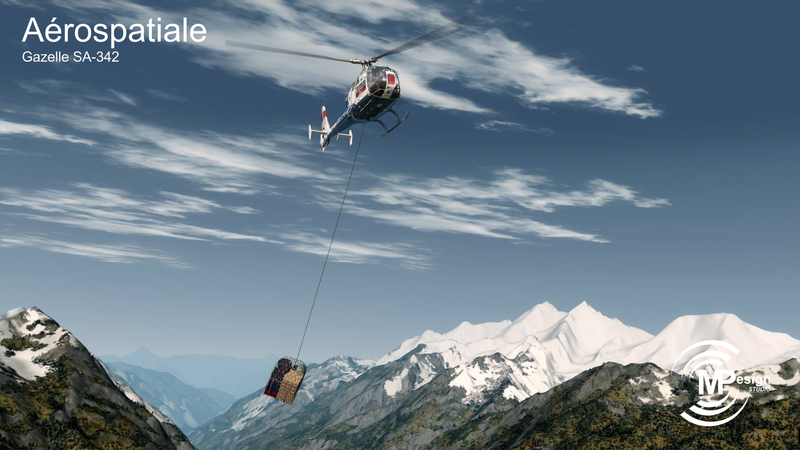 Your helicopter is amazingly lifelike and that makes all the difference in the world. 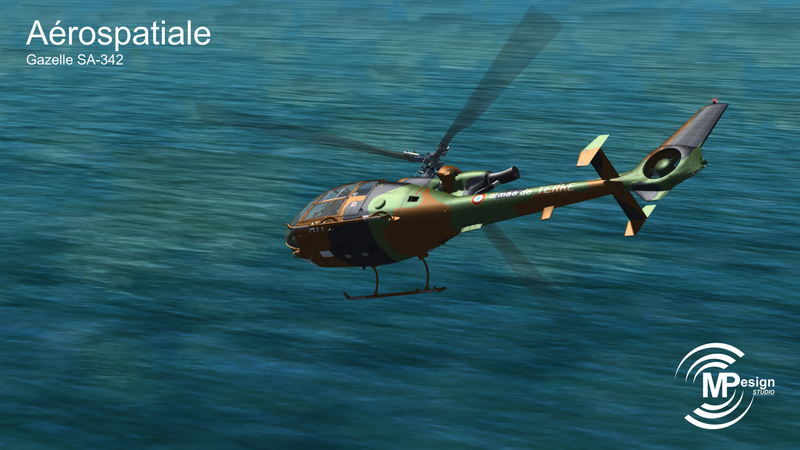 I have hundreds of dollars invested in FSX helicopters and my new “go to” helicopter is going to be one that’s less than $20. I wish I had found yours first. My compliments on an amazing piece of work. 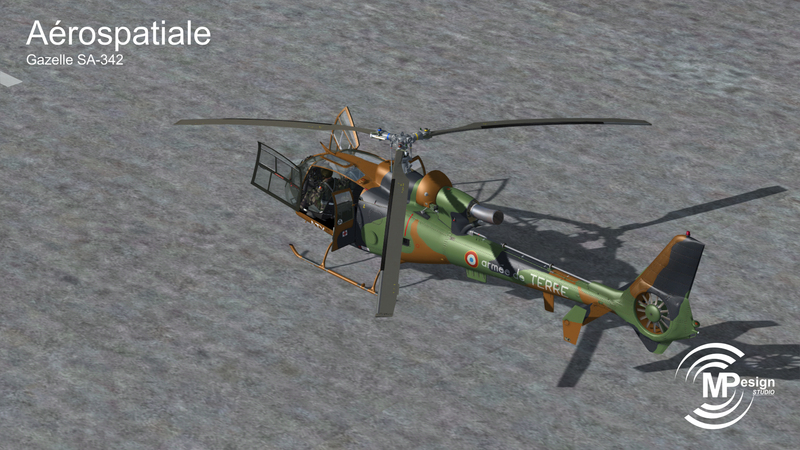 My only issue with this helicopter, and it can’t be helped being a French product, is that everything is in French. 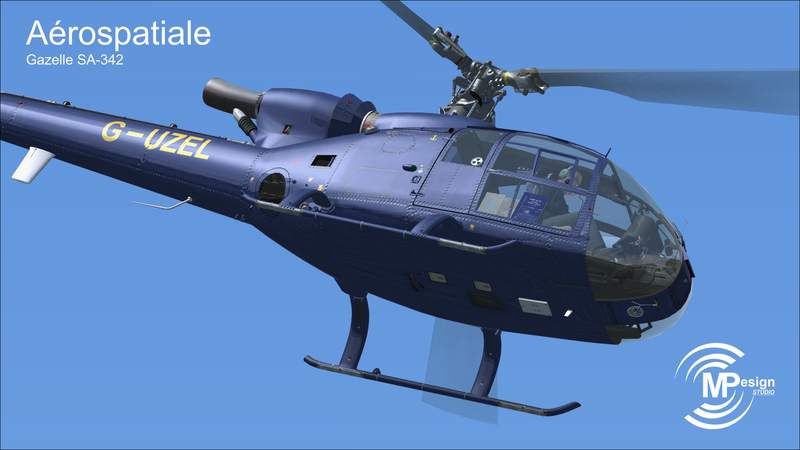 I highly recommend this product for anyone interested in helicopters. e documentation is lacking the cold start procedure, which would have been helpful.